Hi there! 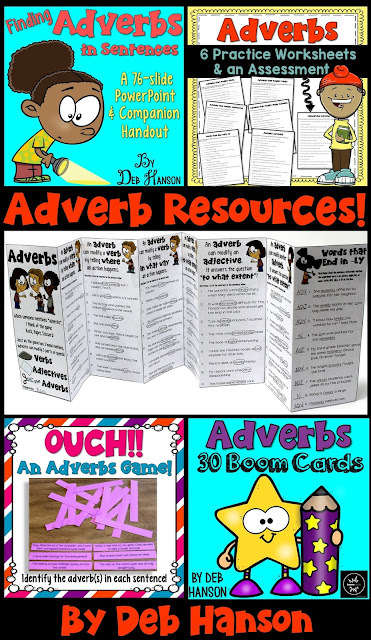 It’s Deb Hanson from Crafting Connections, and I've decided to share an adverbs anchor chart and free printable with you today. First, however, allow me to express my dismay. Did you know that adverbs are specifically mentioned in the 2nd grade Common Core State Standards, but are not named in 3rd, 4th, 5th, or 6th grade standards?!? This puzzles me. 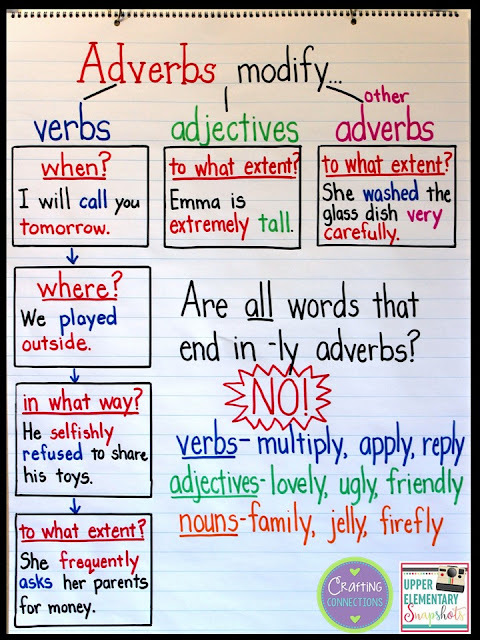 To fully understand the purpose of adverbs, students must first have a firm grasp on nouns, verbs, and adjectives. I must admit, I don't know many second graders who possess that strong necessary foundation! 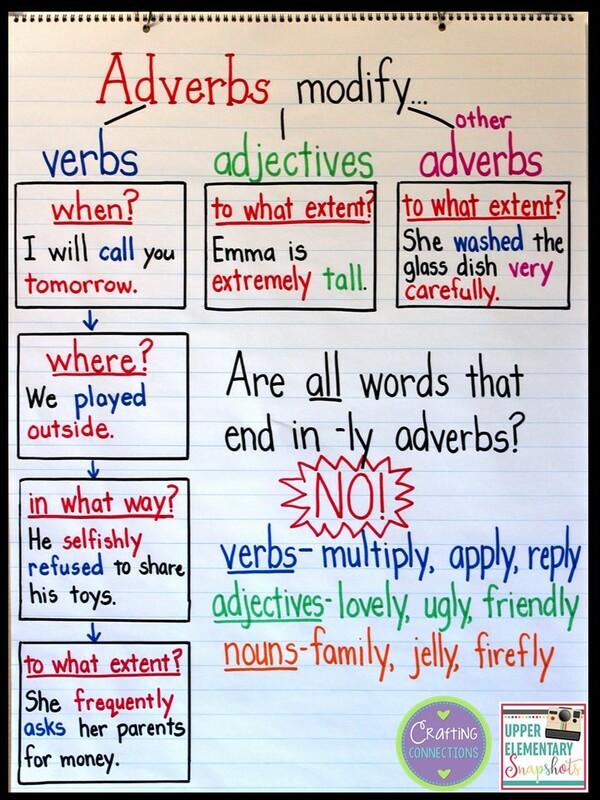 In fact, I have found that most upper elementary and middle school students are easily tripped up by adverbs. Just a few weeks ago, I overheard my daughters (a 5th grader and a 7th grader) moaning about adverbs. My fifth grader was really struggling to complete her language assignment (that focused on adverbs), and my seventh grader stated how "bad at adverbs" she was, too. Yes, adverbs modify verbs. However, they can also modify adjectives and other adverbs, too. The -LY rule! Many adverbs end in -ly, but there are also many adverbs that do NOT end in -LY. Furthermore, there are words that end in -LY that are NOT adverbs. When adverbs modify verbs, they can answer the question where. However, words like "park", "hospital", and "school" are nouns, not adverbs. Adverbs that answer where tend to be more general in nature, like "here", "there", "high", "low", "outside", "inside", "backward", and "forward". I created this adverbs anchor chart. It directly addresses the first two challenging concepts listed above. I created a blank anchor chart for you to give to your students. I suggest creating an anchor chart similar to the one shown above prior to the beginning of class. After you discuss your anchor chart with your students, you can distribute the student printable (shown below). I recommend requiring students to write their own example sentence in each box. This will allow you to check their true understanding of each category of adverbs. After you have checked their anchor chart, you may wish to have your students glue it into an interactive notebook for future reference. Here is an example of a finished anchor chart. If you'd like to view some of the adverb resources that I created, just click on the image below. The resources pictured can be purchased as one bundle, or all of the images are available for individual purchase, as well. Finally, I ran across a fabulous read aloud book that focuses on differentiating between adjectives and adverbs. Hop over to my blog to view the book, and discover how I plan to use it when I teach about adverbs!